The hot August sun sets behind the Sierra Nevada, as I walk a dusty trail toward the old faded yellow Southern Pacific Railroad station, off Narrow Gauge Road, north of Lone Pine. Dry, still desert air suddenly changes into brisk desert breeze. Ahead of me looms a dark brown swirling cloud, a desert dust devil. Many times, I have seen these turbulent little twisters cross the highway and shake my car. This time I have no protection and the dust devil is heading directly toward me. Nowhere to turn. Nowhere to hide. I kneel on the dusty trail, pull my arms over my head, the top of my shirt up over mouth and nose and wait. I hear rushing wind and feel the stinging assault of thousands of sand granules. Closer and closer it comes and now envelopes me. Like a heavy, windy blanket, it covers me. I cannot avoid breathing in the fine dust. After a couple of minutes, it is gone. The air is still and I feel like a desert horned toad covered with fine dust. That was an experience! The Sinagua Indians of Arizona call dust devils “Siwulogi.” The word is pronounced with a hushed whisper, out of respect. They are believed to be evil spirits that emerge from underground. The Sinagua people take off their hats and place them on the ground between themselves and the approaching dust devil. I am told by my Latino Santa Ana parishioners that they call them remolinos. The twisting clouds of dust are to be respected, by making the sign of the cross toward the approaching swirling column. Paul Sinclair of Colorado State University reveals that these dust devils can range as high as 2,000 feet and move from 20-40 mph. Sometimes they can turn over cars and small airplanes. I felt fine after this encounter with the mysterious dust devil. However, the Curse would take time to possess me. Two months later, in October, the change set in: a growing sense of fatigue. So strange. I am in good health, I go to the gym four times a week, but I am getting weaker and weaker, especially in the afternoon. Night sweats set in. painful aching joints. My arms and legs feel like they are being compressed by a huge vice. I can hardly lift my head off the pillow. Breathing is labored and my throat tightens as if someone is choking me. Off I went to Dr. James Sperber, my Internist. Of course the medical tests went after worse case scenarios. MRI brain scan for tumor. X rays for lung cancer. Blood tests for leukemia. Dr. Jim remembered a nurse he had treated a month earlier with the same symptoms. She had coccidiodomycosis, or valley fever. Dr. Jim took another look at the blood work and contemplated that hypothesis. I remembered the encounter with the dust devil. Cocci is a fungal disease common in desert climates, where microscopic spores grow in the soil and wind can stir them up, so that they can land within the moist tissues of my lungs. The disease, first identified in the San Joaquin Valley (thus “Valley Fever”), is increasingly common in California and Arizona. About 150 people die from it annually, but the biggest problem is how the disease, untreated, settles into the lungs and the body and can perforate the lungs. Cocci can literally possess the body with lifelong debilitating consequences. Perhaps Cocci was the legendary curse of King Tutankhamen’s tomb. Several members of archaeologist Howard Carter’s team, who entered the amazing tomb in 1922, died from mysterious diseases. After the tomb excavation, a colleague found a quotation in an old text that warned “dire punishment” would fall upon anyone violating a royal tomb. Some medical experts suggest that the deathly curse came from a long dormant fungus like cocci, lying in the dust among the regal relics. Dr. Jim prescribed a common antifungal oral medication, Diflucan. Within 48 hours, I had recovered sufficiently so that I could mow the front lawn. 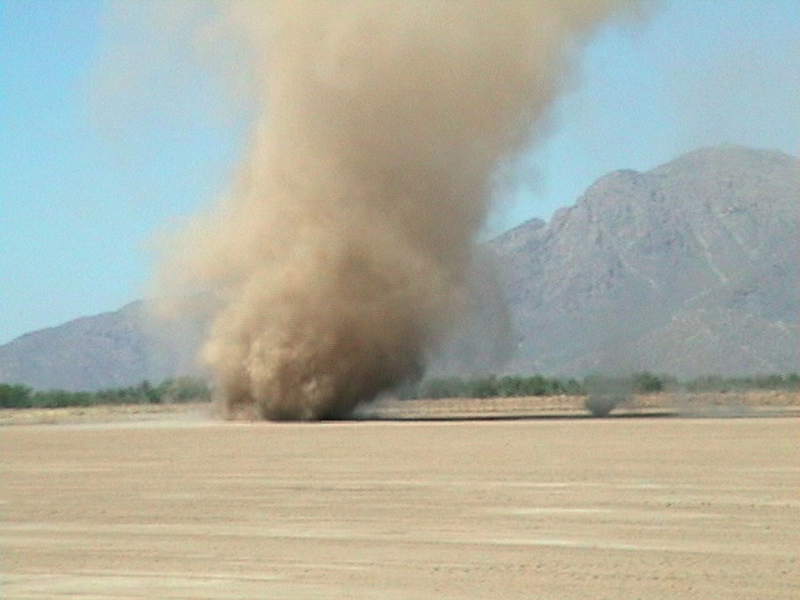 I now have a profound respect for the mysterious desert dust devil. This entry was posted in Blog and tagged dust devil, King Tut, Mary Austin, Native American, Owens Valley, Valley Fever. Bookmark the permalink. Wow Brad! Good one! I’ve encountered the twisters on my spirit walks also. Out of no where they sprung up & passed right through me, a spiritual experience indeed! I pray all will be well with you & your health! Say howdy to Jim Sperber for me also! I am studying/writing about and teaching journaling classes on “Sensing Spirit in Nature.” This is great stuff, Brad! I have virtually no desert experience and I know that there is a hole in my spirituality where that literal experience should be. Thanks for helping me fill in those empty spaces. My “thin places” are in the Blue Ridge Mountains in Virginia–very different, very lush and green, but the Holy Spirit make herself felt here as well, of course.